You can set default information, statuses, and actions to be applied to purchase orders. 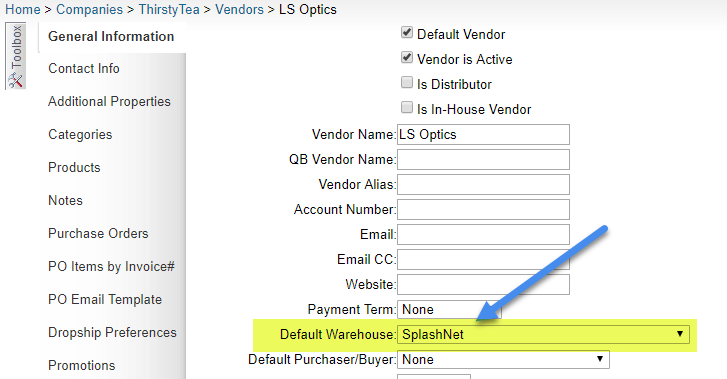 These settings are available under Purchase Orders > Manage Defaults > Company. Show me where. Default Company Name & Address - The default contact profile that appears in the PO PDF. If left blank, the regular company profile is used. PO Default Status - The status of a PO when it is created: Saved, Ordered, Pending. Mark PO as Approved by Default - For clients who require POs to be approved before emailing, this setting sets the default to approved. Manually unapproving can be done from the PO action menu. If a default warehouse was selected here on the vendor's profile, the Ship To warehouse will default to that warehouse. If there is an address on the warehouse, that address will be used.